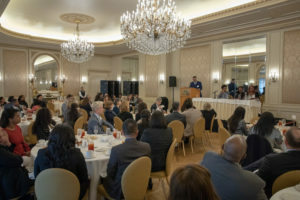 The luncheon featured an esteemed panel with ACLU Criminal Justice Advocate Monica Montgomery, Cal Western School of Law Professor I. India Thusi, and Attorney and Community Leader Lei-Chala Wilson. The panel was moderated by Thomas Jefferson School of Law Professor Maurice Dyson. The luncheon celebrated Dr. King’s legacy and ideology while holding an informed discussion regarding the current state of the civil rights movement from a legal, educational, and community perspective. The panel discussed the importance of using one’s power to influence and shape a narrative that promotes racial equality as envisioned by Dr. Martin Luther King, Jr. They encouraged guests to educate themselves on how implicit bias and generational racial inequality continues to impact our present society. This year’s Luncheon was SOLD-OUT and the Foundation was able to sponsor over 17 law students to attend the event thanks to the support of our donors. In addition, through the generosity of our Bar Success Sponsors Jose & Laura Castillo, the Foundation was also pleased to provide scholarships to two law students to participate in the Minority Legal Education Resources, Inc. Bar Process Management Program here in San Diego. Thank you to those who attended and supported the event. We hope to see you next year!